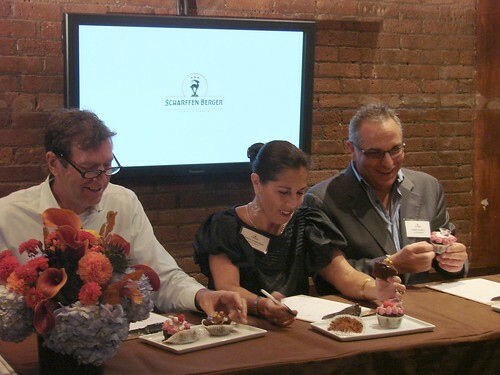 Earlier this month we were invited by Scharffen Berger to their special contest kick off PR event. Seeing as pastry chefs Elizabeth Falkner of Citizen Cake and Johnny Iuzzini of Jean Georges were going to be baking off, that was an invitation Blondie and I couldn't refuse. When we got there it turned out that while Elizabeth and Johnny were baking off with their recipes, we were going to be doing the kitchen leg work. Eeeee. Team Elizabeth would be preparing a "Chocolate Pub Cake." 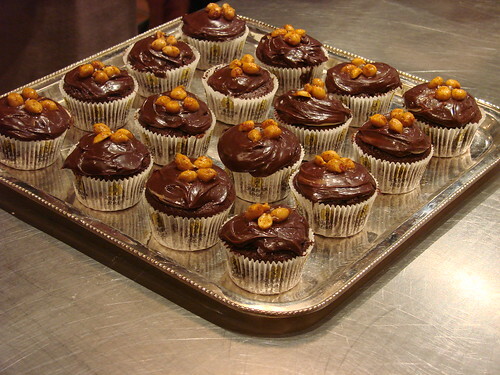 A chocolate stout cake, filled with molasses, topped with fudge frosting, and garnished with spicy Meyer lemon peanuts. Team Johnny would be preparing "Pop-A-Rocksy Rose." A chocolate-beet cake filled with layers of chocolate buttercream, raspberries, and hibiscus-flavored Pop Rocks, yes hibiscus Pop Rocks, covered with a coconut cream cheese foam and topped with a raspberry rose beet buttercream then garnished with a crystallized rose petal as a garnish. They broke us up into teams. Blondie and I were batched in with the late comers and we were both drawn for Team Johnny. 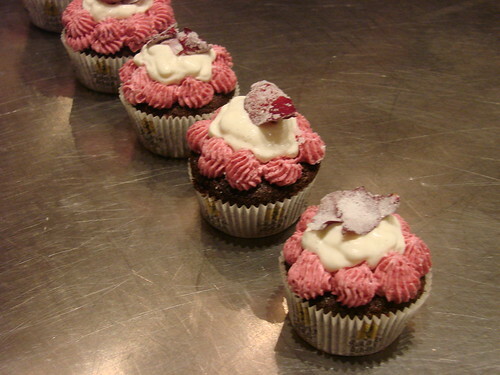 We had around 30 minutes to prepare and assemble the cupcakes according to the chefs' instructions. Fortunately the cupcakes had been pre-baked. Johnny broke us into prep teams and ran down the instructions. Blondie and I were on Team Pop Rocks prep which involve melting coconut butter adding ground hibiscus flowers then coating the neutral Pop Rocks (who knew they had neutral Pop Rocks?!). After a minor incident with the foam application (there was a foam-plosion), our cupcakes came together rather nicely. And in fact when the votes were counted by judges John Scharffenberger, and Grant Di Mille and Samira Mahboubian of Street Sweets, Team Johnny took home the victory. Woohooo! Serious Eats has put up the recipes for Elizabeth and Johnny's cupcakes. And you can find out more about creating your own adventure cupcake recipe here. Today and tomorrow Street Sweets in partnership with Scharffen Berger & Food Network Magazine, will be giving away thousands of free cupcakes around midtown. You can check out Midtown Lunch for the full schedule and follow Street Sweets on Twitter for the latest details as to their whereabouts. 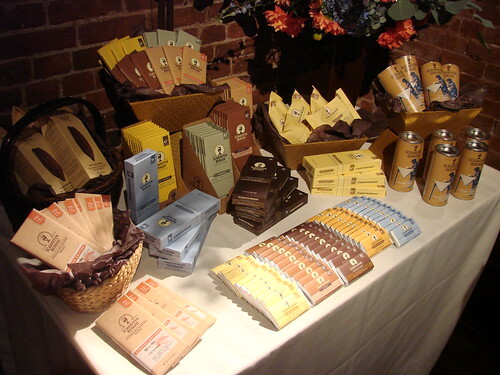 *As I mentioned above Scharffen Berger invited us to their PR event. They also plied us with free cupcakes and chocolate. I'm under no obligation to say they were delicious (which they were). I'm still working my way through the gift bag. Nom nom nom.